Want a pre-workout snack that gives you a visceral energy boost and is packed full of protein, vitamins, minerals and healthy fats? 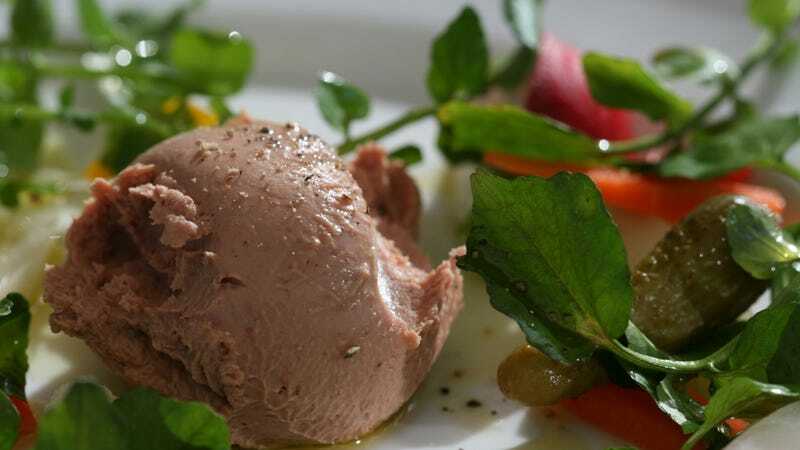 It might sound fancy, but Bison Liver Pate is cheap and easy to make. And damn good. I guess the first thing you need to understand about this recipe is the whole high fat diet thing. Other people explain this a lot better than I do, notably Dave Asprey, start there. Basically, the whole low-fat diet thing was a sham and healthy fats from grass-fed animals actually improve your health, cut your body fat and are the best possible energy source. Aren't bison endangered? No, there's around 500,000 of them in the US and they're raised on farms where, unlike most cows, they're free to roam and eat their natural diet. Hence the whole "grass fed" thing. Bison is also more nutritionally dense than beef, so you can eat less of it. Liver is again more dense, making it something of a superfood. Bison liver is milder in flavor than calve's liver too, so don't be afraid of it. You're again attenuating that liver flavor by making it into pate. A small, 3.5oz serving of bison liver contains 21 grams of protein, 87 percent of your daily Iron requirement and 308 percent of your Vitamin A. That last factor also helps your immune system. Making the pate obviously adds a bunch of fat and a few carbs. But again, using grass fed butter, that's healthy fat. I get my bison from the farmer's market (Wiley loves bison knuckles), but you can order 1lbs of liver here for $11. Told you this was cheap. Total cost here is maybe $14 for enough snacks to last you a week or more or provide an entire dinner party with an awesome appetizer. Half a brick of unsalted Kerry Gold or other grass fed butter. It's the silver pack Trader Joe's sells for like $4. A couple tablespoons of coconut oil. Some pork or chicken sausage. Salt, pepper and any other spices to taste. A few shots of sherry or cognac. A few cups of organic milk. Soak the livers for an hour or so in a bowl of the milk. This helps remove impurities and makes the flavor a little milder. Then, slice the liver into half-inch thick strips. Sautee the onions in the coconut oil over a low heat until they're clear. Turn the heat up to medium/high and add the garlic, liver and spices. Keep it all moving around the pan until the liver's medium rare — pink through. If you're adding the extra sausage, cook it with the liver or, if you just have some leftovers in the fridge, move onto the next step. Shovel all that into your blender, add the butter, booze and whatnot and puree it until it's all smooth. If you want to serve it up all pretty, line a bowl with cling film first, then spoon the mixture in. Once it cools, you can then upend the pate onto a serving plate and garnish with parsley or something. I just pour mine into a reusable glass container and eat it right out of there. Pate is pretty easy to experiment with. Try your favorite herbs and spices until you've perfected it. Serve with slices of toasted baguette, on rice cakes or do what I do and dip apple slices into it. I'm not kidding, you will feel an energy boost after eating this as strong as a good cup of coffee. Unlike that coffee, it'll stick with you for a few hours and brings with it all the stuff you need to build muscle, burn fat and acts like the world's tastiest vitamin pill too.